George Jones had more country songs on the Billboard Chart and more Top 40 songs than any other country artist in history. His musical influence is heard everyday through many of today's biggest country music stars. Experience his legacy and see George Jones memorabilia up close and personal in one of Nashville’s premier museums. Watch performances, listen to some of his top hits, and immerse yourself in George’s powerful story. Located just steps from Nashville's bustling Broadway, the George Jones Museum puts you right in the heart of downtown Nashville. As a world class entertainment venue, the recently renovated 4-story, 46,000 square foot building also features live country music, a restaurant featuring Nashville-style BBQ, and a rooftop bar recognized by Thrillist as one of the "best rooftop bars" in Nashville. Tour the Museum and stop for a quick bite before exploring more of what the Music City has to offer. The George Jones is a world class venue located in the heart of downtown Nashville honoring country music icon, George Jones. Immerse yourself in George's life and legacy with a tour of one of Nashville's most popular museums. A huge collection of "No Show Jones" artifacts, most of which were preserved by his wife Nancy, tell the legend's life story. Take a self-guided tour and view his featured memorabilia, including his signature sequined suits, one of his first guitars (a well-worn Gene Autry Melody Ranch acoustic), his chair, his collection of gold and platinum records, his address book with hand-scrawled numbers for Ray Charles and Johnny Cash, and much much more. After your tour, stop by the Smokehouse restaurant for a quick bite or enjoy the views of Downtown Nashville from the venue's highly acclaimed Rooftop Bar. Between views of the Cumberland River and the Downtown skyline, guests are completely surrounded by all things Nashville. 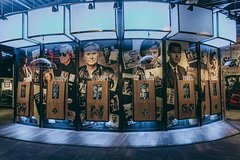 Make the George Jones Museum one of your must-see sites for Nashville; guarantee admission to this popular museum by booking ahead.